← How Do You Cope When it Feels Like You’re Not Doing Enough? A hip fracture is an extremely painful and potentially debilitating injury for your aging parents. As a family caregiver, the care and support you give to your senior after they suffer such an injury will be instrumental in helping them through the recovery, and encouraging them to live a safer and healthier lifestyle as they move forward. Start home health care. Recovery from a hip fracture can be long and difficult. Starting home health care at the beginning of this recovery journey ensures your parent has support and care throughout this process to help them make the most of their recovery. A home health care provider can take on tasks throughout your parents home to give them a chance to rest and recover, as well as provide emotional support and companionship, medication and guideline reminders, and encouragement to make healthy lifestyle choices. These will not only help your parents to work through their recovery, but can protect them from further complications and issues associated with a hip fracture. Be supportive. Keep in mind a senior who has experienced a hip fracture will not only be in serious physical pain, but must also face the challenges associated with their injury. Having a hip fracture can diminish quality of life by decreasing mobility, forcing long stretches of being bedridden, causing chronic pain, and other issues. This can lead to depression and other mental and emotional health consequences. Offering support, encouragement, and love will help to diminish these emotional effects so your parent can focus more on their recovery. Starting home health care for your aging parent can be one of the best decisions that you make for them throughout the course of your caregiver journey. 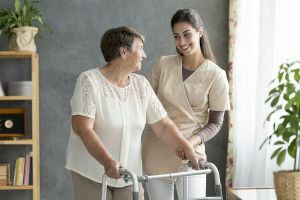 A home health care services provider being in the home with your parent means they will have consistent access to the care, support, and assistance that is right for them. Because you create the schedule of care that works for your parent and for you, you stay at the forefront of your parent’s care routine. This means you can give your parent as much care as you are able to, while still knowing the care provider is there to fill care gaps, fulfill needs you are not comfortable handling or are not capable of handling due to your own challenges and limitations, and offer support and companionship for your parent when you are not able to be with them. This level of dedicated care can help your parent to maintain a more active, engaged, and independent lifestyle as they age in place. For Home Health Care Services in Bartlett TN, please contact the caring staff at Personal Care Services MidSouth today! This entry was posted in Home Health Care Bartlett TN, Personal Care Tips and tagged Home Health Care Bartlett TN. Bookmark the permalink.